With a long tradition of serving the needs of fleet customers, GM subsidiary Opel is constantly evolving and has an impressive list of developments currently in the pipeline. Fleet and commercial vehicle director Ian Hucker reveals all. Could you tell us about some of the key developments at Opel over the past year? 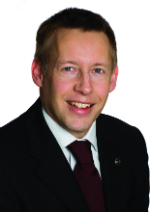 Ian Hucker: It has been a very busy 12 months at Opel. Perhaps the most important development is the recently announced €4 billion investment in Europe by our parent company General Motors (GM). As a result, fleet operators will witness the launch of 23 models and 13 power trains over the next three years. By the end of 2016, around 80% of our engine portfolio will be new, with three new engine families and 1.6L gasoline and diesel turbo engines. These downsized units will deliver more power, reduced fuel consumption and lower carbon emissions. They are perfect to meet the needs of the modern-day fleet operator. We have also seen the appointment of a new CEO, with Dr Karl-Thomas Neumann taking up his new post at the start of 2013. At a recent GM board meeting at our headquarters in Rüsselsheim, Germany, the GM directors announced their full support for Dr Neumann's ten-year plan 'DRIVE! 2022', which foresees our return to full profitability by the middle of the decade. What are your plans for the European market from a fleet perspective? It is our objective to capitalise on the strengths and experience we have in the UK and translate that success right across Europe. We have a long heritage of servicing the needs of fleet customers at a European and global level, and now have more agreements in place with European fleet customers than ever before. Another of our advantages is that we own and work closely with local Opel subsidiaries, unlike some of our competitors, who rely on importers. That gives us far greater control over our abilities to not only offer our customers a pan-European or global fleet policy but also to execute it. We feel we are now very well placed to deliver on our promise of outstanding products and top-notch service for our pan-European and global fleet customers. Which models are particularly attractive to the fleet manager at the moment? Opel and UK sister brand Vauxhall are introducing exciting new models this year, including our chic ADAM mini, the exciting Mokka SUV, the stunning Cascada convertible and the latest development of our flagship model Insignia. We should not forget, of course, our award-winning electric vehicle (EV) Ampera, which is now officially the best-selling EV in Europe. We more than doubled the Ampera fleet customer base across Europe in the space of just six months on the back of increased orders from corporate customers and wider availability on company choice lists. The Ampera fleet customer base across Europe grew from around 700 in March 2012 to almost 2,000 by the end of October 2012. In addition to these initiatives, we have added the most powerful diesel version yet to our Astra range: a fourcylinder 195hp 2.0 BiTurbo CDTI engine with a top speed of 226km/h and outstanding fuel consumption. Could you outline some of the new Opel technologies that help fleet managers drive down TCO and CO2 emissions? Our new power-train portfolio is being introduced as we speak, starting with the all-new turbo-powered 1.6L gasoline and diesel engines, which will combine to drive down running costs and lower carbon emissions. For example, the all-new 1.6L SIDI turbo gasoline/petrol engine features spark ignition direct injection (SIDI) and, compared with our previous unit, delivers a cut in emissions and fuel consumption of 13% while increasing peak power and torque by up to 30%. At the same time, our new 1.6L CDTI diesel version boasts an exceptional power density of 85hp/l, ultra-low fuel consumption of just 4.1L/100km and CO2 emission levels of only 109g/km based on results from the Zafira Tourer. This outstanding combination provides fleet operators with the answers to many of the cost and taxation questions they face today. Fleet and commercial vehicle director Ian Hucker.